and we need volunteers to serve as Family Liaisons (mentors) for the next school year. Individuals or small groups can work with local families living in poverty to help them set goals and find the resources they need to obtain life-long stability! Get your kids involved and volunteer as a family – your older children can tutor, read to, or play with little ones while you meet with their parents! You can make a huge difference in the lives of local families by only giving 4-6 hours a month. Click the image below to sign up to help us with this today! Volunteer with your department, church group, or club – pack weekend food packs for food insecure children! Many children in Charlotte rely on their free school breakfast and lunch – but how do they get nourished on weekends? Each month we provide 120 weekend food packs to children at Hornets Nest Elementary so they don’t have to wonder where their next meal will come from. Sign up today for your group to pack weekend food packs! Upcoming dates available are 5/30, 8/30, 9/13, and 9/27 (more dates are available). Dates may be flexible. To sign up and check available dates email carrie@familiesforwardclt.org. Foster the Love of Reading! For only $5 you can give a child THREE books of their own to foster their love of reading. Families Forward Charlotte has partnered with Promising Pages to help low income children avoid “summer brain drain” with books that are specially selected to interest them, but we need your help to fund the project! Did you know that only 39% of Charlotte’s 3rd grade children are reading at grade level? 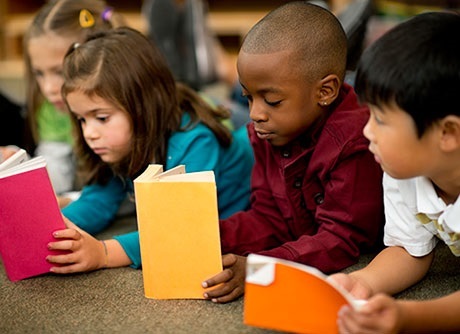 96% of students will graduate on time if they are reading at grade level in 3rd grade. Now you can help encourage reading by giving to this campaign! T-N-T Moving Systems for donating your services to pick up and deliver beds and other home items to benefit a local family! Your generosity ensured that their children will have safe beds to sleep in! Kiet Pham and his team at Ernst & Young for giving of your time and resources! They shopped for and packed 20 essentials baskets full of toiletries and cleaning supplies for local families. These essentials ensure that the family has the tools they need to provide a clean and secure environment. Visit our website or contact us anytime to learn more about FFC and how you can Do Good!